Hey guys! This past Friday, I was fortunate enough to attend Becca Fitzpatrick and Elizabeth Mile's signing at Blue Willow Bookshop. I barely made it on time. Luckily, my very awesome friend, Jess from Gone With the Words, saved me a seat. That's right kiddos. 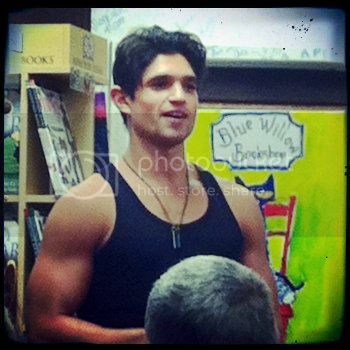 It's Drew Doyon aka Patch from the covers of the HUSH, HUSH series. Needless to say, every girl in the house immediately started taking photos. RAWR! The fabulous ladies discussed everything from their books, to current projects, to chips in ice cream. All of them were awesome, and we had a blast. After their Q&A, we had an opportunity to get our books signed. Sadly, I have yet to read any of Elizabeth's books, but I'm definitely going to remedy that ASAP. Everyone signed books including Patch. The lines were insane, but totally worth it. Be sure and see if they're dropping by a town near you! You won't want to miss out! 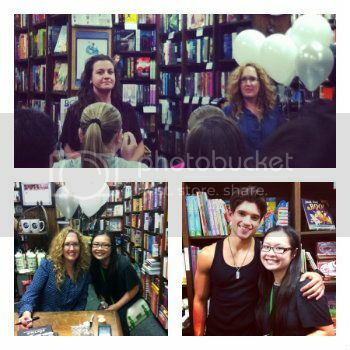 That is SO awesome you got to meet Becca and Patch is quite the cutie, isn't he?! 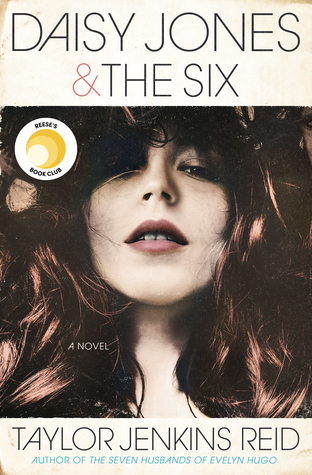 Still need to finish reading this series, lol! Wow, that is fun. Thanks for sharing.